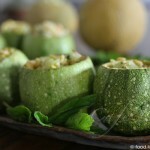 This is a recipe that’s due to make your greengrocer run out of tarragon. I had the pleasure of hosting some of our other local food bloggers for Katherine’s farewell evening, and this was a surprise hit. It’s only cabbage slaw, but everyone loved it, and at least one person ran out to buy tarragon the next day. Tarragon isn’t the most common herb around here — you’ll find big bunches of parsley, cilantro, dill and mint at nearly every greengrocer, but the tarragon will be tucked away in the back, if he even has it at all. It’s not something I used to even buy, until I encountered a wonderful recipe for green beans in Yotam Ottolenghi and Sami Tamimi’s cookbook “Jerusalem.” That’s a common refrain in the blogosphere, isn’t it? Ottolenghi recipes pushing people to buy new things — and even in Israel, where most of his ingredients are actually quite common. And thus, I occasionally have the odd bunch of tarragon, half-used, sitting around my herb drawer. It has a light flavor reminiscent of licorice, which can add a surprising burst of flavor, a flavor people don’t expect to find around here. I’ve been experimenting with it in various salads. Something about tarragon works really well mixed into your most run-of-the-mill cabbage salad — that tart little wilted cabbage slaw that you can find at pretty much any falafel stand. And it turns out that super-simple slaw dresses up real nicely — add some unusual herbs and roasted almonds, and you have a dish fit to serve a king. Or a group of food bloggers, at least. Thinly slice the cabbage into slivers. You can omit the densest part of the core; I usually do. Toss the cabbage, lemon juice, vinegar, salt and oil into a container with a lid. Cover and shake well to combine. Let sit for another 15 minutes and shake again; repeat after another 15 minutes. In fact, you can leave it for a day or two in the fridge at this stage, that’s also fine. 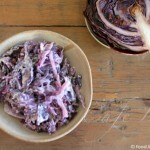 The cabbage will lose volume as it marinates. Finely chop the parsley and tarragon. Put a dry frying pan on a medium to high flame, toss in the almonds, and stir until they look lightly toasted. Mix the parsley, tarragon and almonds into the softened cabbage. 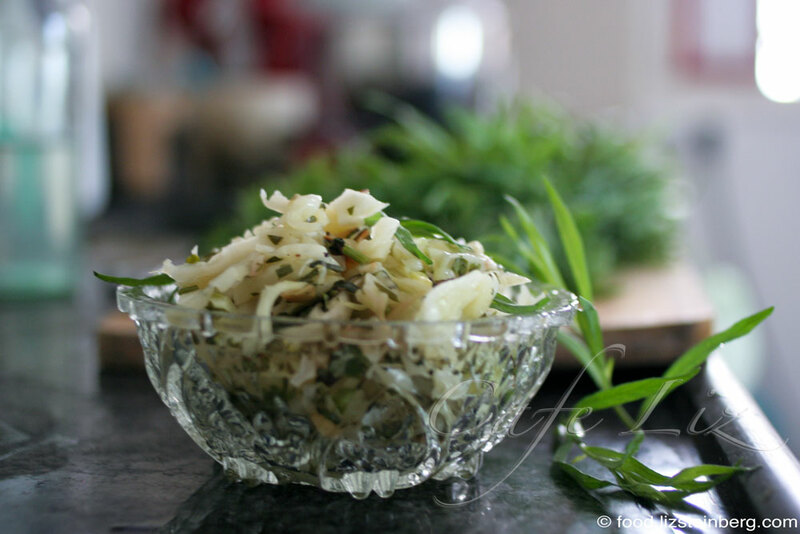 6 Responses to "The surprising tarragon cabbage slaw that everyone will love"
Both tarragon and almonds in slaw are new to me and I cannot wait to try! I do grow tarragon, but have to admit the pot kind’of sits behind other herbs and I use it mostly for certain fish dishes . . . Thanks for the recipe- I wanted to ask you for it. Originally I thought it was basil. Probably because in summer the basil in my garden has licorice undertones. 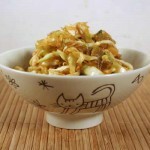 I’ve made cabbage salad with anise seeds which has a similar flavor and is always available. Did Daniel finish all the chocolate chip cookies? Liz, what did you use the other 1/2 bunch of tarragon for?